What if someone told you that you could have more Mega Man whenever you wanted? What if that same person told you that you could have more Mega Man and play with a friend? If either of those questions earned a happy response then boy have I got a treat for you. 20XX by Batterystaple Games is, literally, the answer. It also happens to super fun to play and available right now. 20XX is a rogue-like platformer that bears more than a passing resemblance to the Mega Man X series. I’ve had a chance to play it a few times now, most recently at PAX East 2018, and it has improved significantly with each iteration. It has been available on Steam for a while now, but I got a chance to play the game while it was running on PS4. The biggest highlight of 20XX is the cooperative play. Mega Man has always been a lonely game. You were one lone robot battling against an army of robot masters. When the developers added a second player they changed the entire dynamic of the game. It went from a solitary experience to a shared one. I never knew how much I wanted that until we finished our first boss in the demo. It definitely made the victory sweeter. I can’t wait to play it with my boys. 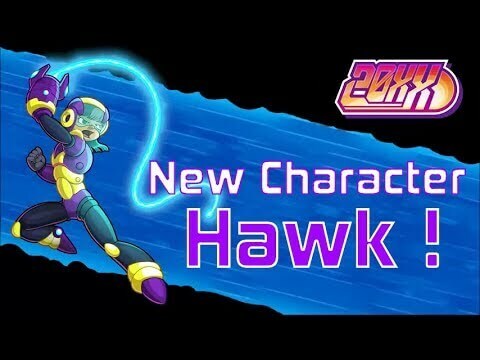 My demo also included a new third character named Hawk. The first two characters, Nina and Ace, were direct analogs to X and Zero from the Mega Man X series, but this character is very different. She plays more like Simon Belmont from the legendary Castlevania franchise. Her primary weapon is a whip that not only deals melee damage, but drains weapon energy from the enemies she hits. This lets her use the special weapons she earns from bosses more frequently. She doesn’t need to worry about energy pickups like the other characters do. Instead, you really need to use the specials more frequently so you don’t waste the energy you drain from enemies as you naturally traverse the levels. This was neat mechanic. It really forced me out of my comfort zone. I play Mega Man games in a very specific way and have since I was a child. I am very conservative with my special weapons and only use them when I think it is “the right time.” I fell into tat same pattern before my demo partner (who happened to be a developer) reminded me about the energy drain. 20XX is currently available on Steam and is coming to PS4 soon. I asked them about other consoles (like the Switch), but they didn’t have anything to confirm yet.